New hardware from smart door lock manufacturer August lets you lock your smart door locks and see who's ringing the doorbell remotely. The August Smart Lock, now enabled for HomeKit control, automates locking and unlocking your door using your smartphone as a virtual key. The addition of a Broadcom chipset to the smart lock allows it to support Apple HomeKit, so you can use Siri voice commands to control and monitor your door lock. You can also control your lock using your Android devices, but voice commands are not yet supported in the August app for Android. The rugged new smart lock still carries the industrial look and feel of the previous model. A new, thin chrome ridge at the top serves as visual lock status indicator. 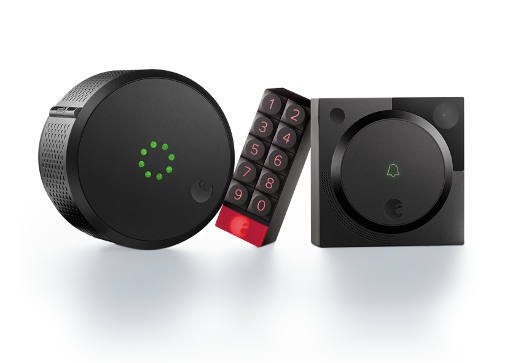 The August Smart Lock can also be set to automatically unlock when you come within range as you arrive at home or to lock when you get out of range when you leave the house. A second new product, the August Smart Keypad, provides an alternative way for authorized users — family members, friends or trusted service providers — to unlock your home's door even without a smartphone or a physical key. You'll generate a unique, one-time-use key code through the August app to send directly to whoever you authorize via SMS message. The battery-powered keypad accessory is slim enough to keep discreetly near the external door knob or installed out of view. August's new Doorbell Cam offers a smarter way for the "Knock, knock! Who's there?" conversation to occur. Its built-in one-way, 140-degree high-definition video camera lets you see who's at the door right through your doorbell. A two-way intercom lets you speak with the person at the door. When the intelligent motion sensor detects human movement at the door, it notifies you and streams live images from the camera, even if the doorbell is not rung. Bluetooth Low Energy and Wi-Fi support on the Doorbell Cam lets you securely control your August Smart Lock even when you're not at home. Installation does not require new wiring; you can connect the Doorbell Cam to your existing doorbell plate. The August HomeKit-enabled Smart Lock ($229, estimated shipping in three to six weeks), August Smart Keypad ($79, estimated shipping in three to four weeks) and August Doorbell Cam ($199, estimated shipping in six to eight weeks) are now available for preorder. Door locks and home security are getting smarter every day. Find out what's new for your automated home and learn the five best smart locks for your home, and review what the updated Kwikset Kevo Plus can do for you.